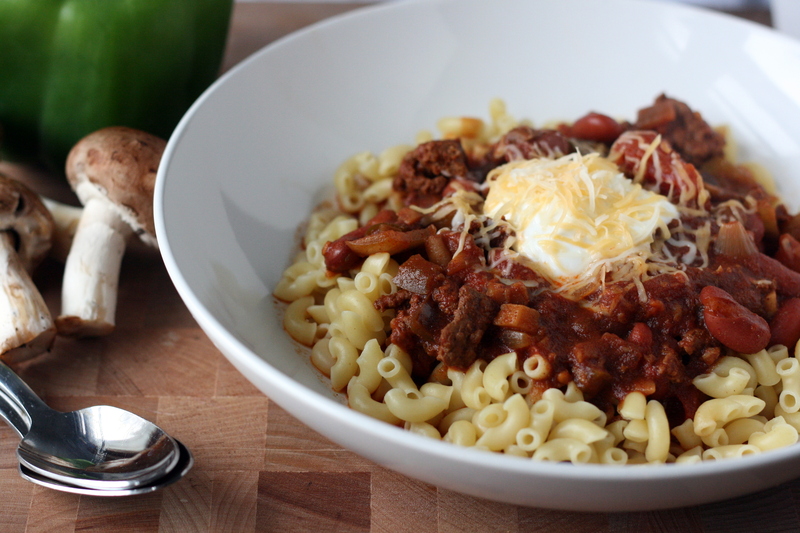 This recipe makes a scary amount of chili mac. But don’t fret – it freezes beautifully! I made it so Mike would have enough food to feed him for a few days while we were apart. If you’re ever short on time, give this meal a try. It’s super simple and comes together in just minutes. As an added bonus, you probably have most of these ingredients lurking around in your pantry and fridge already! Coat a large pan with olive oil spray and heat over medium-high heat. Add beef and cook, stirring occasionally, until browned and cooked through, about 8 minutes. Drain the meat thoroughly and return to pan. Add in onions, chili powder, salt and pepper and stir to combine. Cook until onions are soft, about 5 minutes. Stir in ketchup, mustard, and beef stock. Bring mixture to a simmer and allow to cook until thickened, about 5 minutes. Bring a large pot of water to boil over high heat for the pasta. Cook pasta according to package directions, drain, and set aside. Serve macaroni with a scoop of the chili and top with shredded cheddar, if desired. 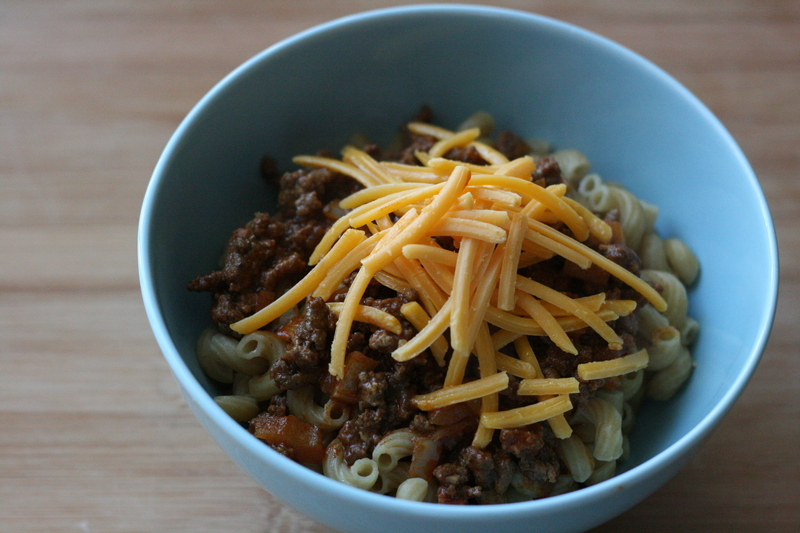 Alternatively, mix the chili and macaroni together and pour into an oven-safe dish. Sprinkle with cheese and broil until cheese is browned and melted. Categories: Beef, Dairy Free, Freezer Meals, Main Entrees, Meat, Money Matters, Pasta, Quick & Easy, Special Diets | Tags: beef, dairy free, freezer meal, main entree, meat, money matters, pasta, quick and easy | Permalink. There are some days where I just don’t have the time (or energy) to cook an elaborate meal. 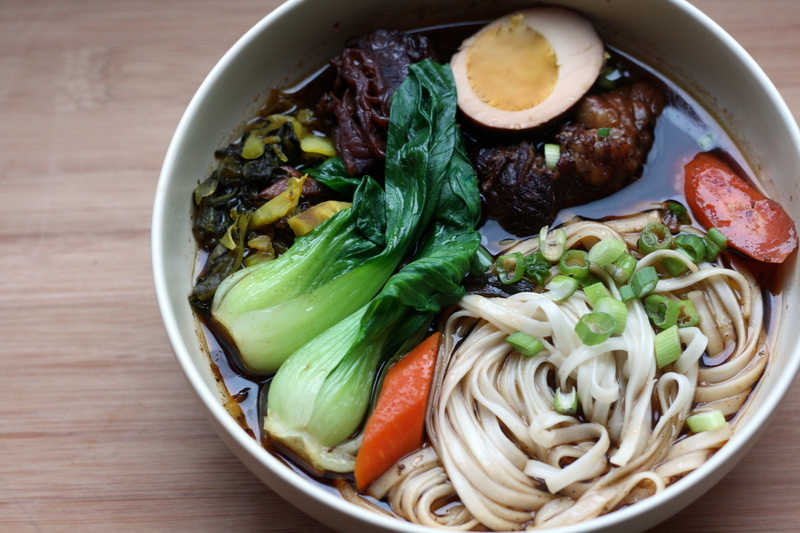 I’ve come to love quick, easy dinners that I can throw together in a half hour. There are some sweet & sour meatball recipes that use only 3 ingredients: frozen meatballs, grape jelly, and chili sauce. I couldn’t even bring myself to consider making it. Instead, I opted to make meatballs from scratch (easy!) and sauce from scratch (easier!). Sure, it took a little longer to whip together than the 3 ingredient meatballs, but it’s well worth it to me! The meatballs are super tender and I love the sauce. I also love the fact that I can pour a healthy dose of Sriracha on top. The only part that beats the fact that it is so simple to make is that this made a LOT of food. That means that Mike and I were able to eat it for breakfast, lunch, and dinner for a couple days 😉 If you’re cooking for a small group, you may want to cut the recipe in half. To make the meatballs: combine all ingredients in a large bowl. Mix by hand until just combined, being careful not to overmix. Shape into 1 – 1 1/2 inch balls and place on prepared baking sheet. Bake for 10 – 15 minutes or until lightly browned. Set aside. Meanwhile, make the sauce. Pour reserved pineapple juice into a large pot over medium heat. Whisk in water, vinegar, soy sauce, brown sugar, corn starch, and salt. Cook, stirring occasionally, until thickened. 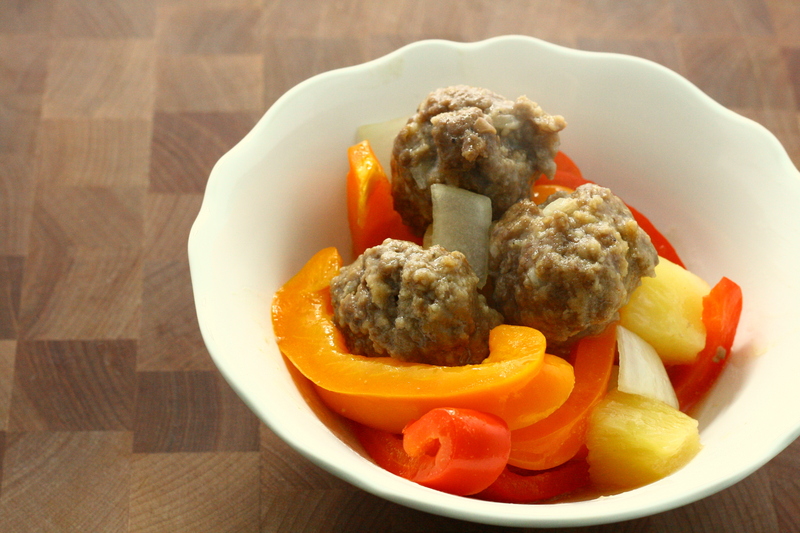 Stir in pineapple chunks, onion, bell peppers, and meatballs into the sauce. Gently stir to combine and simmer for 15 – 20 minutes or until meatballs are cooked through. 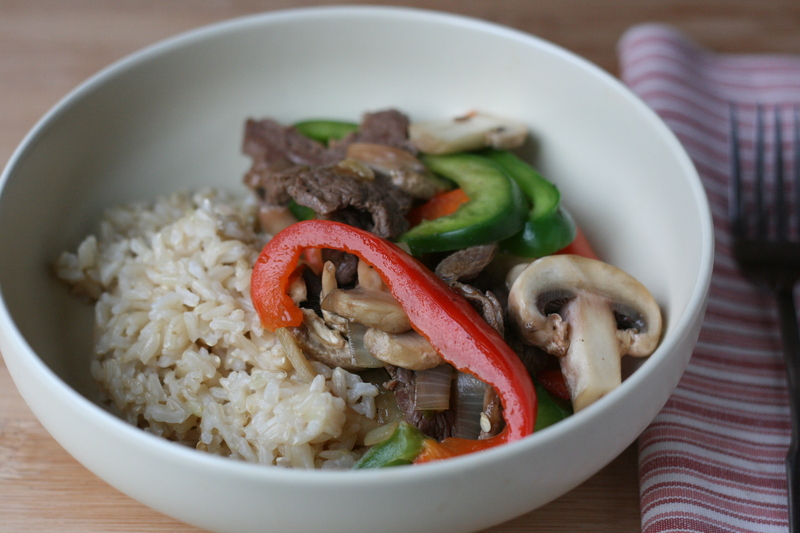 Categories: Beef, Dairy Free, Main Entrees, Meat, Quick & Easy | Tags: Asian, beef, main dish, meat, onion, quick and easy, rice, vegetables | Permalink. 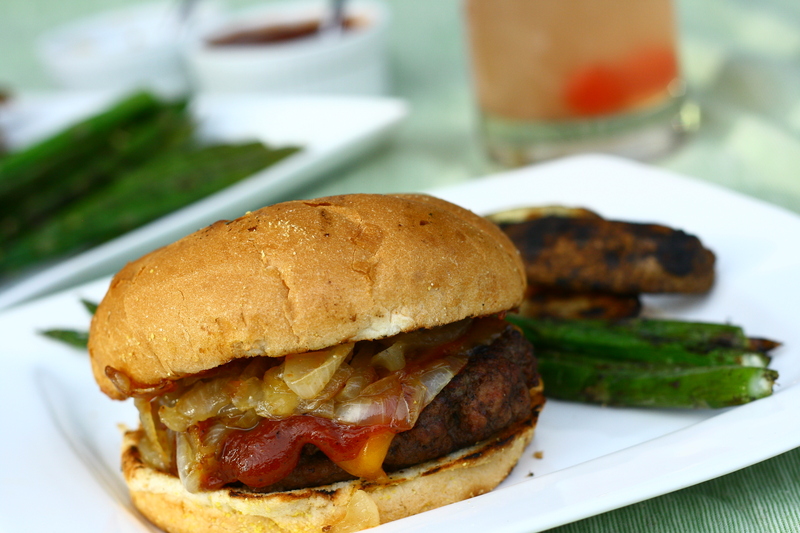 There’s something about a perfect burger that just screams “summer”! Even though it’s only spring, and even though it’s been a fairly cold spring so far, this burger made everything a-okay. I forgot for a few hours that summer was still forever away. Mike and I enjoyed these burgers with some grilled asparagus, grilled potato wedges, and of course, some fresh whisky sours. To make the whiskey barbecue sauce: combine all barbecue sauce ingredients in a medium saucepan. Bring to a boil, stirring frequently. Reduce to a simmer and cook for 40 minutes, or until thick. To caramelize the onions: heat olive oil and butter in a medium pan over medium-low heat. Add in onions and cook, stirring occasionally, for 10 minutes. Add in brown sugar and continue to cook, stirring occasionally, until onions are caramelized and soft, another 10 – 15 minutes. To make the burgers: shape beef into 4 even patties. Make a depression in the middle of each patty with your thumb. Season both sides with salt and pepper. Heat a grill to high heat and cook burgers until slightly charred and browned on one side. Flip and cook burgers on second side until browned and slightly charged. Top with sliced cheddar cheese during last minute of cooking. 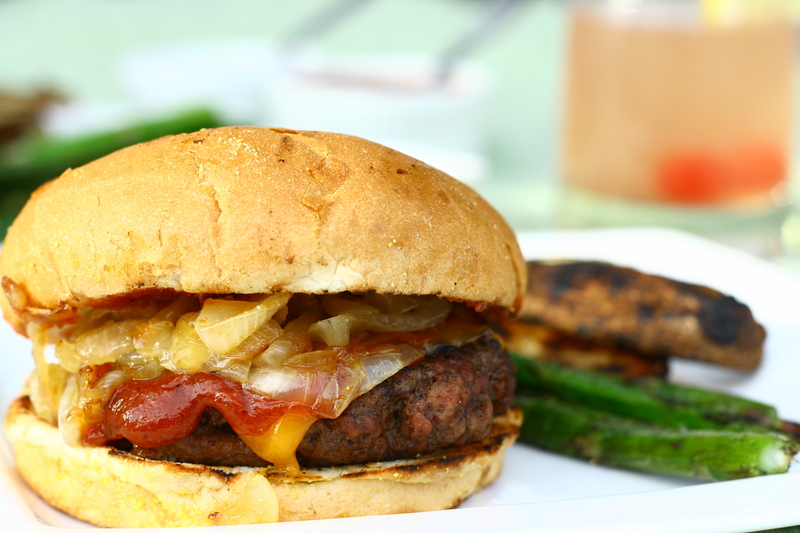 To assemble burgers: place a patty onto the bottom of roll. Slather with barbecue sauce and top with a heaping spoonful of caramelized onions. Top with other side of the roll and serve immediately. Categories: Beef, Main Entrees, Meat, Sandwiches | Tags: beef, cheese, grill, main dish, meat | Permalink. I love burritos. I especially love the as-big-as-your-face abominations from Qdoba and Chipotle. If I spend a day with my college friends, there’s a pretty good chance you’ll find us at either a Qdoba or Chipotle at some point during the day. After all, we can’t live on beer and whiskey alone. But apparently beer, whiskey, and burritos = well rounded diet. Some habits die hard. It’s been 3 years since we graduated, but our drinking and eating patterns during our weekends together are essentially the same. The only difference is now instead of drinking Milwaukee’s Best Light, we drink something a little classier like Miller High Life ;). Anyway, back to the burritos. Up until now, I’ve never had a baked burrito. Baking these until they developed a perfectly crunchy outside brought the burrito to a whole new level. I ate one and died of happiness. So I ate another. I instantly regretted it, but it was just so… good. So learn from my mistake – eat only one. They are very, very filling. Preheat oven to 450°F. Spray a large baking sheet with cooking spray and set aside. To roast the poblano for the sauce: place inside a medium baking dish. Bake in preheated oven and turn every 6 – 8 minutes until skin is blistered on all sides, about 25 minutes total. Place in a clean kitchen towel and wrap up. Let cool slightly and rub the skin off the pepper with the towel. Remove the stem, seeds, and ribs. To make the burritos: heat oil in a large skillet over medium heat. Add onions and cook until they begin to soften, about 3 – 5 minutes. Add in ground beef and cook and stir to break up the meat. Cook until well browned. Add in garlic and tomato paste and stir well to combine. Add in black beans, beef broth, cumin , oregano, chili powder, cayenne, brown sugar, and salt. Bring to a boil, reduce heat to a simmer, and cook until most of the liquid has been absorbed. To assemble the burritos: place 2 – 4 tablespoons of cheese at the end of a tortilla and spoon in some of the beef mixture over the cheese. Fold the left and right sides of the tortilla in and then roll the tortilla up, starting from the end closest to you. Place seam-side down on prepared baking sheet. Repeat with remaining tortillas. Spray tops of burritos with cooking spray. Bake in preheated oven until lightly browned and crispy, about 25 minutes. Meanwhile, make the sauce: melt butter in a medium saucepan over medium heat. Stir in chopped roasted poblano and jalapenos. Sprinkle in the flour and stir to combine. Cook, stirring frequently, until flour is lightly browned, about 1 – 2 minutes. Whisk in chicken broth, garlic powder, salt, and pepper. Let cook over medium heat, stirring frequently, until the mixture bubbles and thickens. Remove from heat. 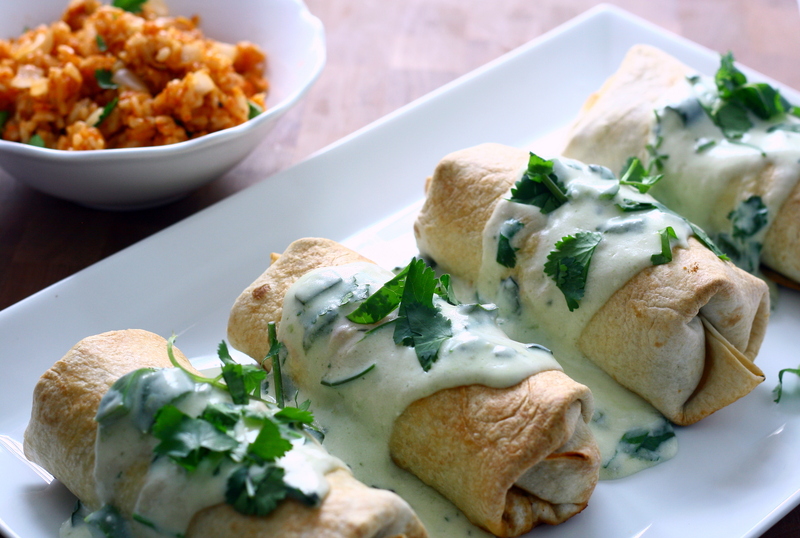 Stir in Greek yogurt and cilantro. 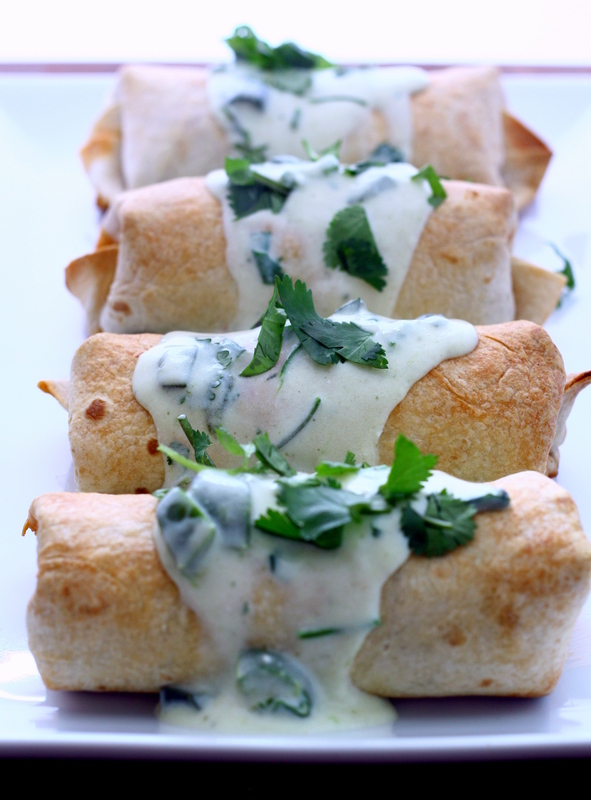 Serve over baked burritos. Categories: Beef, Main Entrees, Meat | Tags: beef, cheese, main dish, meat, onion | Permalink.